The new law of coasts passed by the conservative Spanish government and allowing construction only 20 meters from the coast (it used to be 100m), a scandal on its own right, will have direct effects on the already extremely fragile protection of the cave of Praileaitz, located within an active quarry and holding evidence of human existence from the Magdalenian period but also, we know now, from Neanderthal times some 100-120 Ka ago. 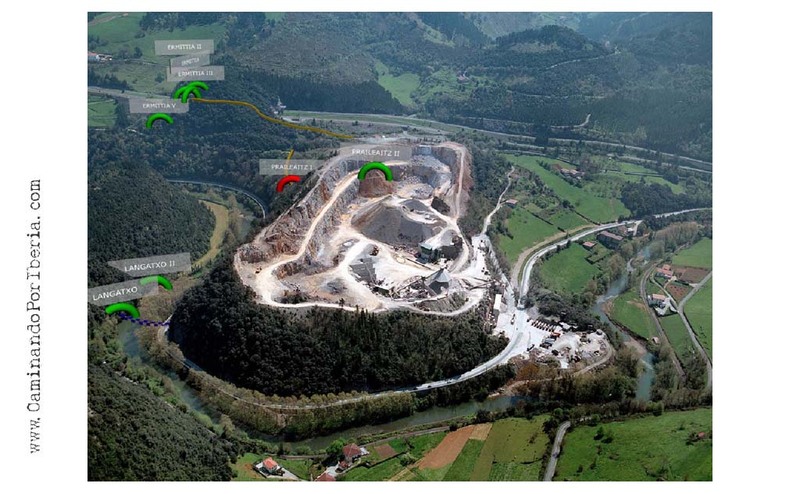 Years ago, the (then unelected) Western Basque Government limited the protection area to just 65m, considered by all experts wildly insufficient (Jean Clottes asked for 500m, for example), however a tribunal ruled later that 50m was enough. This new law allows for constructions and economic activities (such as the quarry) to take place just 20m away from the cave galleries, what may be very damaging. There are possible mechanisms to counter this legislation but require of a political will that so far has been lacking or rather negative, hostile. Sources[es]: Gara, Caminado por Iberia, Bertan, Amigos de Praileaitz. Update (May 11): a report (in Spanish language) on the Mousterian and new Magdalenian findings from Praileaitz can be read at Noticias de Gipuzkoa (via Pileta). The alleged hybrid characteristics are only attributed to morphological data of the bones (the bulk of the paper), what is always subject of great debate. Otherwise most people would just think in terms of Neanderthal, as the individual from Monte Lessini is also from a Mousterian context. By this I do not mean there was no interbreeding in the Neanderthal direction, just that without clear genetic data, I fail to see such morphometric speculations as conclusive in any way. In this article we examine the mandible of Riparo Mezzena a Middle Paleolithic rockshelter in the Monti Lessini (NE Italy, Verona) found in 1957 in association with Charentian Mousterian lithic assemblages. Mitochondrial DNA analysis performed on this jaw and on other cranial fragments found at the same stratigraphic level has led to the identification of the only genetically typed Neanderthal of the Italian peninsula and has confirmed through direct dating that it belongs to a late Neanderthal. Our aim here is to re-evaluate the taxonomic affinities of the Mezzena mandible in a wide comparative framework using both comparative morphology and geometric morphometrics. The comparative sample includes mid-Pleistocene fossils, Neanderthals and anatomically modern humans. This study of the Mezzena jaw shows that the chin region is similar to that of other late Neanderthals which display a much more modern morphology with an incipient mental trigone (e.g. Spy 1, La Ferrassie, Saint-Césaire). In our view, this change in morphology among late Neanderthals supports the hypothesis of anatomical change of late Neanderthals and the hypothesis of a certain degree of interbreeding with AMHs that, as the dating shows, was already present in the European territory. Our observations on the chin of the Mezzena mandible lead us to support a non abrupt phylogenetic transition for this period in Europe. A recent paper has made the headlines all around questioning the, so far widely accepted, late Neanderthal survival in the Iberian Peninsula. I was so puzzled by the conclusions that I decided to hold back and await if I could muster some more information. Soon I was made to realize that the limelight-seeking authors only provided two new datings and could not even question at all some of the most relevant “late survival” dates like those from Gibraltar or the more recent one of very late Mousterian (22,000 BP) in a remote district of Cantabria (apparently not even known to the authors). before the Proto-Aurignacian appears at ca. Middle and early Upper Paleolithic sites. until proven otherwise in this region. Achieving two new dates (out of eleven trials) is no major hit, even if useful. The results have been oversimplified when presented to the media (and/or by the journalists themselves). The new dates do not disprove that Neanderthals may have been there in later periods. Any conclusions would need to wait for a more extended revision of dates. Collagen preservation is much worse in Southern than Northern Iberia, what may actually imply some need for revision of dates towards more ancient ones (not just the Middle Paleolithic ones but also those from the initial Upper Paleolithic). This part is rather supportive but with due caution. Dates should not be considered alone but in their stratigraphic and archaeological context. The two sites have a very complex stratigraphy, what affects the interpretation of the new dates. There may be pre-conceptions behind this exaggerated claim, such as attachment to the Finlayson model of Neanderthal collapse in Europe before the arrival of modern humans, which is surely wrong. Also I will add on my own account that, unlike what has been published in some media, this result would not cast absolutely any doubt on the Neanderthal admixture episode, which must have happened not in Europe but, surely, in West Asia long before our ancestors set foot in Europe at all, just at the beginnings of the migration out of Africa (to Asia first of all, not to Europe) c. 125-90 Ka ago. Update (Feb 12): Basque prehistorian Joseba Ríos Garaizar inaugurates his new blog with an article[es] on this issue. He argues that the two new dates do not seem enough to revolutionize the whole understanding of Neanderthal periodization in SW Europe, especially with the recent re-dating of Saint-Césaire (which confirmed Neanderthal authorship of Chatelperronian and gives a date as late as c. 36 Ka BP, uncalibrated) and the various and also recent datings for Mousterian in the North of the Iberian Peninsula (Arrillor, Fuentes de San Cristobal, Esquilleu, Sopeña) all with dates more recent than 40 Ka BP (uncalibrated). In addition to these Axlor (Basque Country) has a Mousterian layer above another dated to c. 42 Ka BP (uncal.) and Lezetxiki is probably in the same situation. On top of those Mousterian layers many sites have their own Chatelperronian layer, of clear Neanderthal manufacture. And then there are the already mentioned cases of the anomalous late Mousterian from Cantabria recently dated to 22 Ka BP and several Southern Iberian caves, including Gorham (Gibraltar), which appear also to be more recent than the dates managed by Wood et al. The Nefud or An Nafud is a desert that sits on the North of Arabia Peninsula. Last year, tireless archaeologist Michael Petraglia published a paper on a newly found archaeological culture from that, now so arid, region (see here) dated to c. 75,000 years ago. as either Neanderthals or Homo sapiens. the age of the technology and the recovery of two Levallois flakes. corresponding with the origin of Homo sapiens in Africa based on mitochondrial DNA  and nuclear genomic  age estimates and fossil finds , . indicating the presence of archaic hominins  in Arabia, and possibly early representatives of the Neanderthals . Notice how the Jubbah sub–sites (the two Jebels) fall between two Levantine Mousterian sites: El Wad and Tabun C, attributed to Neanderthals. So it is very likely that this colonization represents an expansive attempt by West Asian Neanderthals. Possibly related is the also recent finding (Delagnes 2012) of Mousterian in Yemen, dated to c. 55,000 BP. Therefore it would appear that after the expansion of Homo sapiens in Arabia, eventually leading to the colonization of Southern and Eastern Asia, as well as Near Oceania, there was an expansive tendency of Neanderthals as well, which may have helped to partly erase the genetic remnants of the out-of-Africa episode in the most fertile parts of Arabia Peninsula. Yet another South Arabian industry has been researched and described, this time in the mountain range of Western Yemen, which runs parallel to the Red Sea coast. A. Delagnes et al. 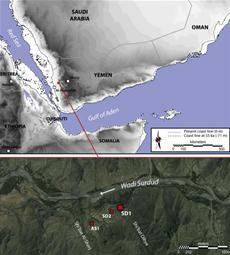 Inland human settlement in southern Arabia 55,000 years ago. 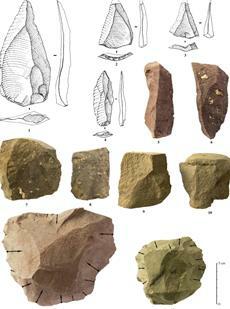 New evidence from the Wadi Surdud Middle Paleolithic site complex, western Yemen. Journal of Human Evolution. Pay per view. The recovery at Shi’bat Dihya 1 (SD1) of a dense Middle Paleolithic human occupation dated to 55 ka BP sheds new light on the role of the Arabian Peninsula at the time of the alleged expansion of modern humans out of Africa. SD1 is part of a complex of Middle Paleolithic sites cut by the Wadi Surdud and interstratified within an alluvial sedimentary basin in the foothills that connect the Yemeni highlands with the Tihama coastal plain. A number of environmental proxies indicate arid conditions throughout a sequence that extends between 63 and 42 ka BP. The lithic industry is geared toward the production of a variety of end products: blades, pointed blades, pointed flakes and Levallois-like flakes with long unmodified cutting edges, made from locally available rhyolite. The occasional exploitation of other local raw materials, that fulfill distinct complementary needs, highlights the multi-functional nature of the occupation. The slightly younger Shi’bat Dihya 2 (SD2) site is characterized by a less elaborate production of flakes, together with some elements (blades and pointed flakes) similar to those found at SD1, and may indicate a cultural continuity between the two sites. The technological behaviors of the SD1 toolmakers present similarities with those documented from a number of nearly contemporaneous assemblages from southern Arabia, the Levant, the Horn of Africa and North Africa. However, they do not directly conform to any of the techno-complexes typical of the late Middle Paleolithic or late Middle Stone Age from these regions. This period would have witnessed the development of local Middle Paleolithic traditions in the Arabian Peninsula, which suggests more complex settlement dynamics and possible population interactions than commonly inferred by the current models of modern human expansion out of Africa. The dates are relatively late, considering we know now of sites in the area since c. 130,000 years ago (in Palestine, Dhofar and Sarjah) but the site is still an interesting addition to the collection of reconstructed stories of the peoples who lived in Arabia early on, whose genetic remnants are still present most probably according to Behar 2008. I find particularly interesting that the peoples of this culture made blade tools, which are previously only common in South Asia. But some “Levallois blades” are known to exist in Mousterian contexts for examples, being different in production from Aurignacoid ones – and this seems to be the case. Everything is possible but we should not forget that the Homo sapiens of Palestine did use Mousterian technology, a fact that may be related to Neanderthal genetic introgression among us. See also category: Out of Africa in this blog. And specially, besides the links in-text, this entry on the various options for the OoA migration, which are necessarily much older than this group. 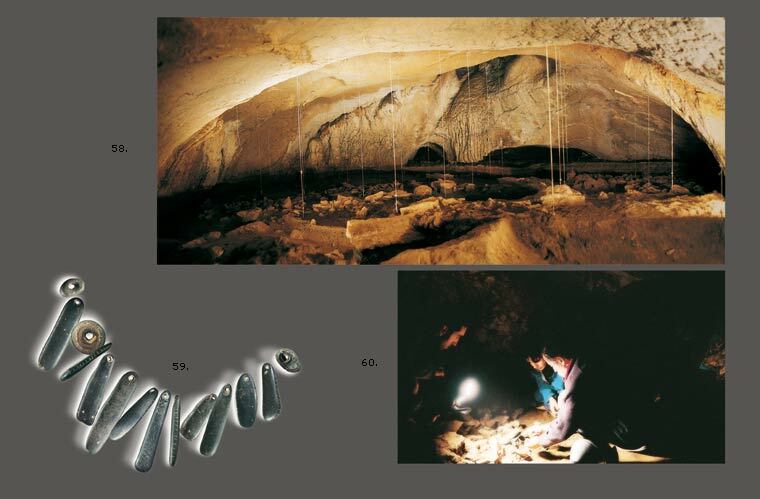 Julien Riel-Salvatore mentions today in his blog that another instance of Neanderthal hafting has been discovered, this time in Romania (Râşnov Cave), dated to 33.3-28.9 Ka. BP (uncalibrated) and with Mousterian technology (generally associated with Neanderthals). A previous case was known to exist in Palestine (Umm el Tlel, c. 40-70 Ka BP). Findings of birch pitch tar, also used for hafting, are even older: 125 Ka in Germany and maybe even older in Italy, evidencing the use of different technical solutions for the same problem. I refer to A Very Remote Period Indeed for the papers and further details. New research has found that the Ionian islands of Lefkada, Kefalonia and Zakynthos were never united to land, what implies that the Mousterian findings (probably Neanderthal-made) belong to peoples who crossed from the mainland, almost necessarily on boat or raft of some sort (they could have swam in theory but hardly with kids and all the family, you know). Source and more data at New Scientist (found via Pileta). Reference paper: G. Ferentinos et al., Early seafaring activity in the southern Ionian Islands, Mediterranean Sea. Journal of Archaeological Science 2012. Pay per view.